Unlike some letters, there are not many examples of family names found in Pompeii that begin with a D. There is one, however, the Decidii, that though small in terms of the epigraphic material, is rather interesting for the fact that one member appears to be the subject of adoption. Generally speaking, in the Roman world, adoption was not something that concerned young children, but was an act carried out in adulthood in order to create a male heir when there was none. This could be for financial or political reasons, but was, in most cases, an attempt to create a legacy, perpetuating a family name when no male issue existed. Typically, this was done when one had something besides just a name to leave behind – wealth, power, or influence. This appears to be the case for a Decidius, who through adoption becomes the first (epigraphically) known member of another gens, one that eventually is one of the most powerful in Pompeii. According to Castrén, the gens Decidia was of Sabellian (i.e. Samnite) origin, indigenous to the region. There are attestations of at least seven members of the family. These are dated in the Augustan and Neronian periods – so presumably represent at least two generations of the family, possibly three. 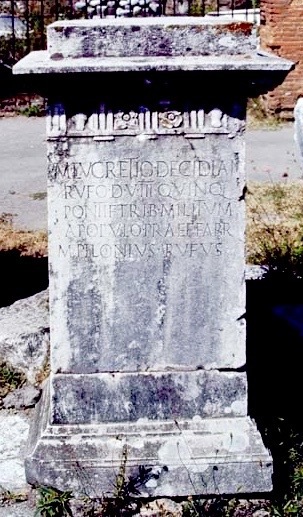 The earliest attestation of a Decidius comes from a dedicatory inscription dated to AD 3 which names Marcus Decidius Faustus, the freedmen of two men named Marcus – likely a father and son. Messius Arrius / Silenus / M(arcus) Decidius MM(arcorum) l(ibertus) / [- – – F]austus VNG / min(istri) Augusti / M(arco) Numistrio Frontone / Q(uinto) Cotrio Q(uinti) f(ilio) d(uum)v(iris) i(ure) d(icundo) / M(arco) Servilio L(ucio) Aelio / Lamia co(n)s(ulibus). ‘Messius Arrius Silenus, Marcus Decidius Faustus, freedman of Marcuses, perfumer, ministers of Augustus. To Marcus Numistrius Fronto, Quintus Cotrius, son of Quintus, duovirs with judicial power, to Marcus Servilius and Lucius Aelius Lamia, consuls. A child of this family is found in one of the city’s necropoleis. Inscribed on a columella associated with a large group burial area to the east of Porta di Nocera, it is difficult to date firmly, but is most certainly from the Augustan period or later. M(arcus) Decidius / M(arci) f(ilius) / Macer v(ixit) a(nnos) VIII. This is the first mention of a Decidius who does not have the praenomen Marcus, but it is not the only one. Though it is a bit of a leap to suppose it is the same Lucius, two texts, found in the Forum, dedicated to the most prominent member of the gens names a Lucius as his father. M(arcus) Lucretius L(uci) f(ilius) Dec[i]d(ianus) Rufus dec(reto) dec(urionum). M(arcus) Lucretius L(uci) f(ilius) Dec(idianus) Rufus / IIvir iter(um) quinq(uennalis) / trib(unus) milit(um) a populo / praefect(us) fabr(um). The relationship between Marcus Lucretius Decidianus Rufus and the Marci Lucretii named above is unclear, but he also dates to the Augustan / early Julio-Claudian years. What is clear is that whilst he began his life, and presumably came of age, as a member of the gens Decidia, he was at some point, adopted into the gens Lucretia. This is evident from his name. The suffix -ianus was typically added to the original nomen of the adoptee, and it would shift to follow the nomen of the new family into which he was adopted. Usually, this meant also incorporating the cognomina of the adoptive man, unless he had none. In this case, Rufus is likely the cognomon of the Lucretius who adopted Marcus Decidius. This man, unfortunately, is otherwise unattested. The adoption seems to be one that allowed a man from a seemingly small and relatively obscure family to gain the connections (and likely finances) that allowed him to raise to the upper echelons of Pompeian politics. Marcus Lucretius Decidianus Rufus served in numerous offices, was honoured with multiple statues and dedications in the Forum, including some that were granted posthumously, and is only one of two men known to have served as pontifex in Pompeii (the other being Gaius Cuspius Pansa II). M(arco) Lucretio Decidian(o) / Rufo IIvir(o) III quinq(uennali) / pontif(ici) trib(uno) mil(itum) a populo / praef(ecto) fabr(um) ex d(ecreto) d(ecurionum) / post mortem. What perhaps is particularly interesting about this man is that he is the first epigraphically known member of the gens Lucretia in Pompeii. The Lucretii will come to dominate political and civic life in the Neronian and Flavian periods, when Decimus Lucretius Satrius Valens and his son Decimus Lucretius Valens were holding both magisterial and religious offices and providing lavish gladiatorial games. The importance of Marcus Lucretius Decidianus Rufus as an ancestor is evident. One member of the family, the last attested belonging to the gens Decidia, Marcus Decidius Pilonius Rufus, is responsible for restoring monuments to his predecessor both in the Forum and the Temple of Isis after the earthquake in AD 62. M(arco) Lucretio Decidian(o) / Rufo d(uum)v(iro) III quinq(uennali) / pontif(ici) trib(uno) militum / a populo praef(ecto) fabr(um) / M(arcus) Pilonius Rufus. M(arcus) Lucretius Decid(ianus) / Rufus IIvir III quinq(uennalis) / pontif(ex) trib(unus) mil(itum) / a populo praef(ectus) fab(rum) / M(arcus) Decidius Pilonius / Rufus reposuit. What I find interesting is the fact that these two monuments were restored by relative of his birth family and not of the adoptive family. Considering the importance of the Lucretii in the period when this restoration occurred, the likely scenario is that the Decidii, who never gained the same prominence as their ancestor’s adoptive family, took it upon themselves to elevate their social standing by re-establishing the familial link between the two gens by reminding their fellow Pompeians that one man was responsible for the origin of the current generations of both families.